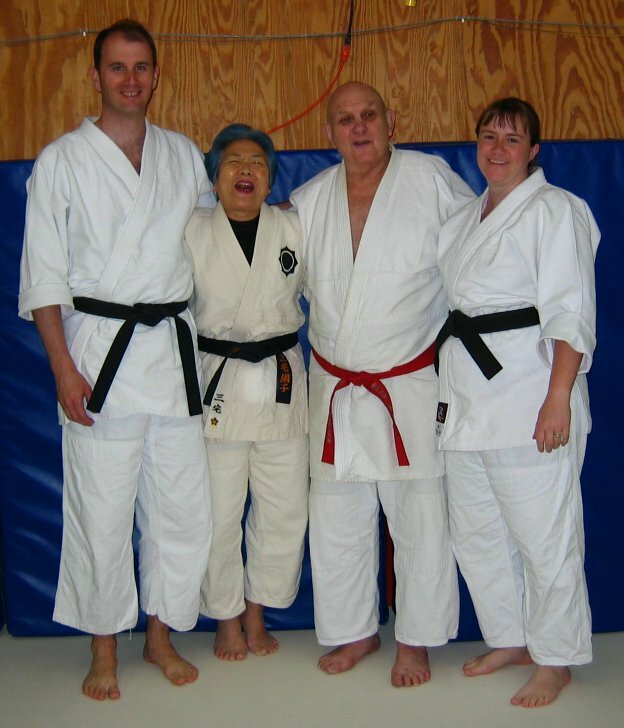 Heather Gawlick began her training in 1994 and is now a Shihan (master level 6th degree black belt) in Aikido. She founded Shinju Dojo in Albuquerque, New Mexico in 1999. She has spent many mat hours at Windsong Dojo in Oklahoma City and went to many seminars hosted by Karl Geis in Houston, Texas. Heather and Roy met at an Aikido seminar with Karl Geis in Houston. After they married, Heather moved to Vancouver, Canada where they reopened the Dojo together. In 2018, they moved to Longview / Kelso, Washington where they currently enjoy teaching. There are several styles of Aikido - a martial art originating from Morihei Ueshiba (1883 - 1969) in Japan. One of Ueshiba's students was Kenji Tomiki (1900 - 1979). Tomiki also trained with Jigoro Kano, the founder of Judo. As a long-standing professor at Waseda University, he was concerned with developing a style of Aikido that would be easy to teach and quick to learn as well as being effective. Karl Geis (1933 - 2014) learned Aikido in Japan at the Kodokan. He was promoted to 6th degree black belt in Aikido by Kenji Tomiki and became one of the founders of the Fugakukai International Association. Karl was awarded a 10th degree black belt in both Judo and Aikido and held a 9th degree black belt in Jodo. Karl Geis is listed in the Black Belt Magazine Hall of Fame. Our Aikido is neither traditional Uesheiba-style nor strictly Tomiki-style. It has a very strong Tomiki background. However, unlike traditional Tomiki groups, we do not participate in competitions. We train slowly, gently, and safely focusing on off-balance points to initiate throws rather than pain compliance or joint locks. Instead of sparring, we prefer to study free-style Aikido in a gentler randori learning environment, like traditional Judo schools do.